Billions of dollars are spent every year trying to keep people alive. Whether it’s through surgical procedures, pharmaceuticals, supplements, gym memberships, or the like, people are spending big to stay alive. Yes, it’s a great idea to add years to your life. But in my opinion, a more useful goal is to add life to your years. Make the years count by taking care of yourself, staying positive, and engaging your mind and body with interests and hobbies. After all, if you plan on sticking around longer, shouldn’t you enjoy yourself? Age is just a number; it’s simply the most efficient way to measure how many seconds, minutes, days, months, and years you’ve been alive. It should not determine your behavior and hold you back from doing the things you want in life. I know people in their late 60s and 70s who’ve adopted cycling as a major hobby, have run half-marathons, and have hiked through jungles. They did it because they don’t look at age as a number. Instead, they assess what they want to do and how they can accomplish it. They set a goal and stick to a plan. Only about 25% of how a person ages is determined by genetics, meaning you’re in control of the remaining 75%. How do you control it? By the lifestyle decisions you make. You can choose to be active or sedentary. It’s up to you whether or not you want to smoke and drink regularly. You can choose to eat a healthy balanced diet instead of processed, fatty, and sugary foods. And those are only the physical aspects you control. You can also decide to engage your mind and take part in social activities that foster and strengthen relationships. If you want to extend your life, have a purpose. 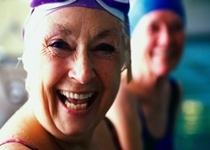 There are studies that show people with a positive outlook can outlive their peers. Why? Because they look forward to things. When you’re active and engaged with your own life, set goals, nurture relationships, and just enjoy yourself, you have reason to get up and at it every day. It also means you’re likely healthier than someone who doesn’t have these things, because these things tend to come part and parcel with activity, fitness, and both mental and physical stimulation. So what can you do to adopt a positive lifestyle? Get involved; it doesn’t matter with what. It could mean getting involved with a passion of yours and researching it. It might mean joining a community group. Perhaps it’s joining a gym, walking the dog, or gardening. Maybe it’s reconnecting with friends and family, or going out to try something new and meet new people. It really doesn’t matter how old you are or what you’re doing, as long as it gets you up and active, motivated, and excited about waking up in the morning. I’m sure you can tell the difference between someone who’s passionate and somebody who isn’t. You probably have friends who seem rather indifferent to the world, simply going through the motions every day. They don’t seem to particularly care about anything, or have anything that gives them a reason to get up. These people are surviving; they aren’t living. On the other hand, think of the people you know who seem to have a zest for life. They usually look younger, are in better health, and are on the go more often than not. People with a zest for life seem to be more interested in learning, experiencing, and doing the things that make them happy. They realize that their time on this earth is limited, so they should take advantage of it. By getting out and embracing your passions and interests, you, too, can add life to your years instead of just years to your life. It doesn’t matter if you’re rich or poor, young or old, sick or healthy, you can do it. There are so many stories from people of all walks of life who’ve been able to battle disease, lose weight, and stay alive because they found passion and motivation. When they have something to live for, they live longer and better. We’re still in the first couple of months of the new year, so I’d like to issue a challenge to you: if you’re just going through the motions every day, staying sedentary, and isolating yourself from the world around you, I’d like you try something that you’re interested in. Think about a new skill you’d like to take up or a new restaurant you’d like to try with some old friends. Better yet, try doing something different every week; try cooking with a new ingredient, travel a different way to work, or take a trip to a different neighborhood. But whatever you do, I urge you to get involved and take control of your life and health. After all, the more active you are, the more life you pack into your years, and the more years you’re likely to have. Levy, B.R., et al., “Longevity increased by positive Self-perceptions of aging,” Journal of Personality and Social Psychology August 2002; 83(2): 261–70. Brooks-Wilson, A.R., “Genetics of healthy aging and longevity,” Human Genetics December 2013; 132(12): 1323–38. Firfer, H., “Adding Life to Your Years,” CNN web site, August 26, 2014; http://www.cnn.com/videos/health/2014/08/26/exp-hm-add-life-to-years.cnn, last accessed January 28, 2015.